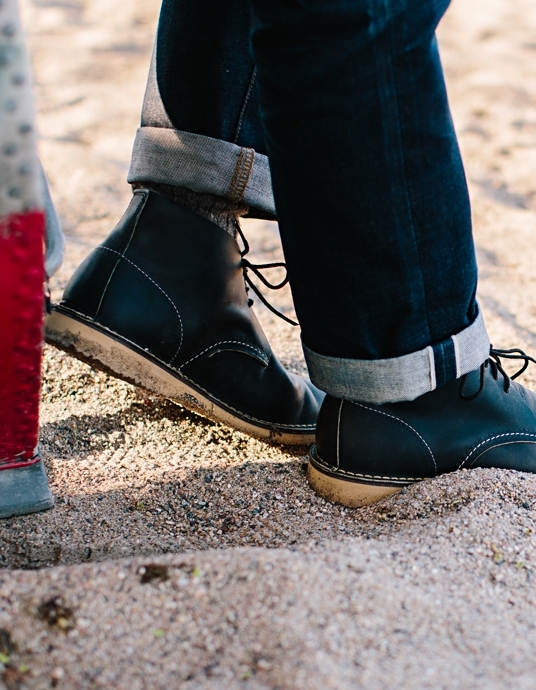 Red Wing's All New Desert Boot | Valet. The heritage brand's innovative (and insanely comfortable) riff on a classic. Red Wing has long made handsome, quality boots built to last. If there was a downside to buying a pair, it was that they tended to be ruggedly weighty and required some time to break them in. But just because the trusted Minnesota brand is well over a hundred years old, that doesn't mean they're done innovating or experimenting. Case in point: the new Weekender collection—flexible, lightweight alternatives to the heritage brand's hefty workaday stompers. Inspired by the desert boots worn by British officers in WWII, the collection is offered in two modern silhouettes, an oxford and a chukka boot. Instead of using the traditional Goodyear welt, the Weekenders are handcrafted in a stitched down construction using locally-tanned leathers and Red Wing's proprietary ComfortForce footbed, designed to give instant comfort right out of the box without sacrificing any of the signature craftsmanship. And unlike your standard desert boots, these can easily be resoled, which means you'll be able to keep wearing these easygoing, wear-anywhere shoes for years. And trust us, you'll want to. American soldiers in the first World War were issued Red Wing No. 16 boots. A fool-proof footwear collection that's been edited down to the essentials no gentleman should be without. If you want some new shoes for the coming spring that are cool—in every sense of the word—go with suede.